Life Experiences Series enlightens mind, lifts the heart. Imaginary Journey Series features fascinating places. Light Series enhances settings before technology. Prairie Series peers into beauty and simplicity of 1800s era. 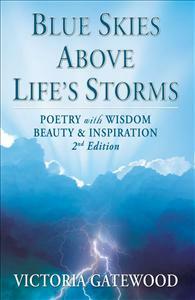 Blue Skies Above Life’s Storms offers inspiring content of poetry and stories. The Life Experiences Series enlightens one with wisdom, insight and clarity to triumphantly overcome life’s challenges. The imaginary Journey Series invites one to spiral downward from the top of a rainbow, sail the world on a tall ship or visit the homestead of a great grandmother during the civil war era. The Light Series glows with the enchantment of a campfire, lamplight and lantern in story poem settings. The Prairie Series envisions a world of infinite space, sea of rolling grasslands, epic sights of grandeur before technology.